Design is a strong instrument for changing our habits, including eating habits. More and more studies are coming out on how design can be used to fight overweight problems. Nowadays more than 30% of the world’s population suffer from overweight. There are many different methods out there on how to fight overweight and design is one of them. The crinkly plate is a unique design product, which is based on many studies over several years. After searches for the form, testing, interviews this plate has been developed to help lose weight or change eating habits for everyone, including you. The idea is mainly based on scientific studies and optical illusion. We eat with our brains (despite how weird it may sound). Our vision is the main sense, which we use already since preparation of the meal, serving and until the eating process. Vision gives us 83% of all information in comparison to other senses. The crinkly plate is not only small in comparison to a standard dish you are using right now, but it also creates an optical illusion. That all is achieved thanks to 3D, that makes this dish unique. Food from above (see below the illustrations of the dish from above) looks the same on both dishes, however it is actually less (see the illustrations from the sectional side view). Thus our brains are being fooled that we have eaten the same amount. If in our evolutionary history we had to fight for survival and food, so we would have eaten before others would have taken away from us and to uptake calories fast, then nowadays food is available and we can make storage. However in todays fast rhythm and stress, we eat fast without noticing it. 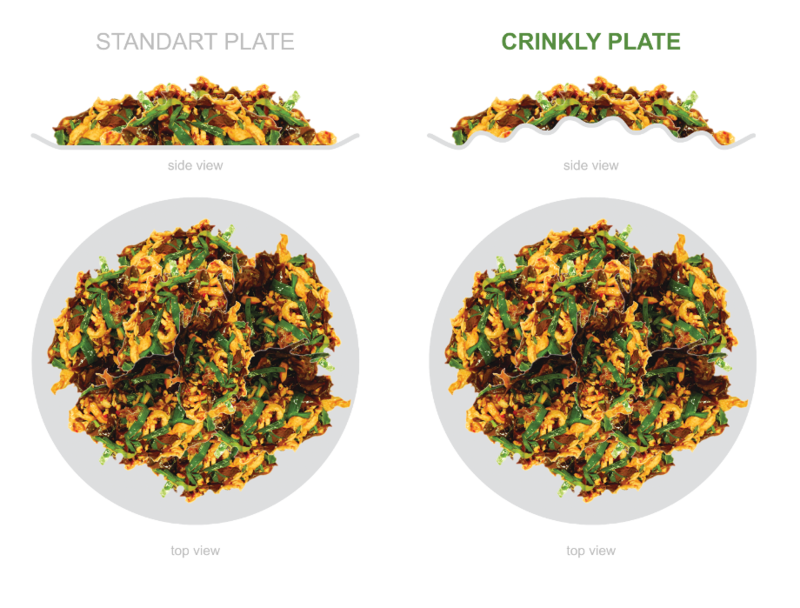 Thus the crinkly plate not only makes food look bigger, but the uneven texture also slows down the eating process. Right now the dish is in prototype phase, after which the testing will be applied using scientific methods. Afterwards we want to inform you about the results and product availability. Moreover, you can get a discount as a one of the first users if you will leave your e-mail address. Get first info when crinkly plate will be availabe!